You are a hospital, medical transport company, a medical facility and /or a licensed healthcare provider in the state of Arizona, as defined by A.R.S. § 33-931, or are an employee or agent of the above expressly authorized to enter into this contract for services. You hereby expressly authorize SWL to act as your agent for the limited purpose of preparing, signing, notarizing and filing medical liens and medical lien releases pursuant to A.R.S. § 33-931 et. seq. and UCC Financing Statements and Amendments pursuant to A.R.S. 47-9101 et. seq. You recognize and agree that SWL has different levels of service which provide for different levels of involvement and responsibility and that you are contracting for Level 2 services. 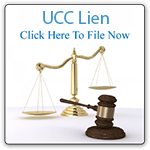 Level 2 services ensure that the lien or lien release is in the proper format, with a proper digital signature attached and that it is electronically filed with the pertinent County Recorder’s Office or Office of the Arizona Secretary of State using SWL unique electronic preparation and filing system within 5 business days, unless expedited filing is specifically requested. You have the option of putting the notice and lien in the mail and mailing copies of them to all parties specified by the statute, or authorizing us to do it for you. You agree to pay SWL lien preparation fees, filing fees and other fees and costs, as set forth in SWL Fees and Cost Schedule, which you have read and understand. You expressly recognize and agree that you are solely responsible for determining whether the patient that is the subject of the lien or a lien release, is a proper person or guardian of a proper person subject to a medical lien filing under A.R.S. § 33-931 et. seq. and/or A.R.S. 47-9101 et. seq. Further, that you are solely responsible for ensuring the information in the lien is truthful, accurate and meets the requirements of Arizona Law and you have exercised good faith in authorizing each electronic filing for every patient for whom you submit a lien or lien release preparation form to SWL to file on your behalf. You agree to defend, indemnify and hold harmless SWL from any claims, suits or actions made or filed by any person or entity as a result of a medical lien or lien release filed by SWL and/or UCC Financing Statement and Amendments pursuant to this contract, agreement and the terms and conditions specified herein. FURTHER, you agree the limit of any liability that SWL, its agents, officers or employees may have for the filing of an improper or invalid lien or lien release is limited solely to the total fees for those services. Much of the information set forth in this website is Copyright© protected material and will not be disseminated, used or reproduced without SWL’s express permission. Southwest Liens is not a law firm and does not provide legal advice to customers. Customers with legal questions are advised to consult with a licensed attorney. SWL, Inc. does act as a conduit for communications for level 1 customers only, when those communications are solely related to liens SWL, Inc. has prepared and filed, but does not negotiate or resolve liens or legal issues related to liens.